Of the great ballerinas, Tanaquil Le Clercq may have been the most transcendent. She mesmerized viewers and choreographers alike – her elongated, race-horse physique became the new prototype for the great George Balanchine. The muse to both Balanchine and Jerome Robbins, they loved her as a dancer and a woman. 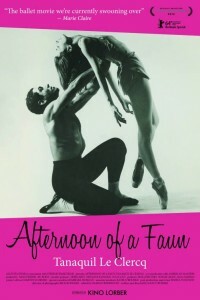 Balanchine married her and Robbins created his famous Afternoon of a Faun for Tanny. She was the foremost dancer of her day until it suddenly all stopped. At age 27, Tanny was struck down by polio and paralyzed. She never danced again. A personal, accessible look at an artist - Kevin Barnes, frontman of the endlessly versatile indie pop band of Montreal. .
A documentary on the late singer/songwriter Amy Winehouse, who died of alcohol poisoning in 2011. .